The influence of the aesthetics and imagery of Asian art will be strong in our May exhibition. Wataru Sugiyama slyly infuses a contemporary charm and, at times, humor into what we recognize as traditional Japanese motifs in his ceramic sculptures. Lewis Anderson digitally blends photographs of the Pacific Northwest into landscapes that exist in a world of his own invention but have distinctive undercurrents of traditional woodblock landscapes. Large in scale, at times up to 80” wide, these landscapes have the ability to draw you in and hold you. Show runs May 4th-30th. 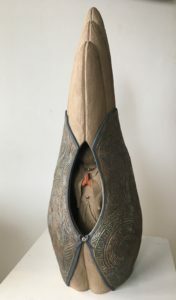 Join us for an artist reception on First Friday, May 5th, 5-8 p.m.
Wataru Sugiyama has cultivated an appreciative audience for the Haniwa type imagery in his sculpture. Elements of Japanese history and mythology are almost the exclusive focus of Wataru’s creations. He interprets imaginary and existing objects and gives them a modern twist by bringing his personal vision to these subjects. His sculptures are truly inspirational, have a powerful presence, sense of humor, and make a strong impression on his viewers. Besides historical elements, extremely fine detail and exquisite facial expressions are featured on his sculptures. Lewis Anderson accurately describes his art as being somewhere between photography and painting, somewhere between East and West, somewhere between contemporary and ancient. The images invite the viewer to explore quiet moments in diverse landscapes full of light and shadow and symbology. 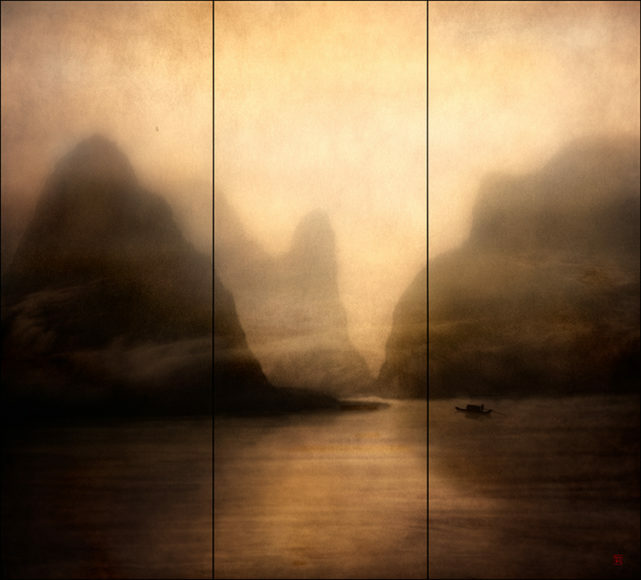 An ancient river winds through tall foreign mountains, full of soft golden light and blue fog. A single silhouetted figure in a small boat appears to be slowly rowing into the unknown in one of the three scroll-like panels of Boatman. This timeless image, like the others in Lewis Anderson’s Dynasty collection, emanates a strong sense of peace, solitude and mystery.